Note [4.7.16 @ 11:50 AM EST]: I’m writing this before Views from the 6 drops. 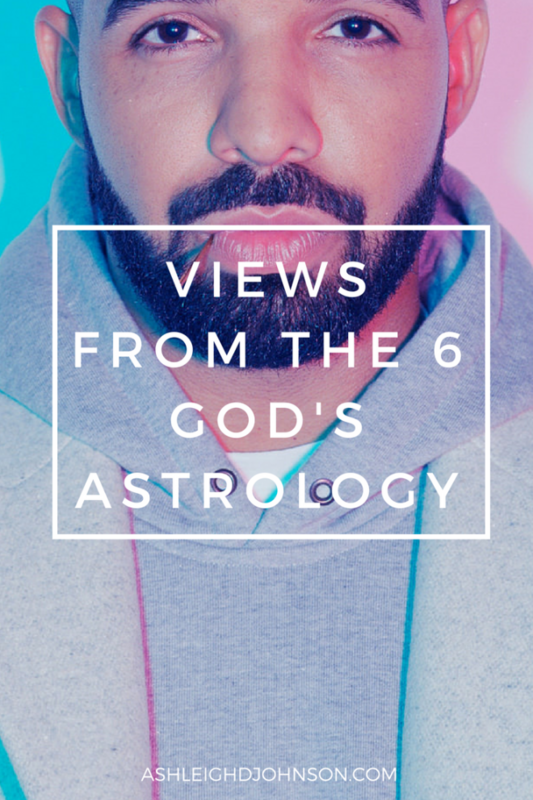 What does Drake’s astrology have to say about his upcoming album Views from the 6? I’m a Drake fan. Always have been. Probably always will be, given he doesn’t do anything that’s unforgivable. Since he’s released a few tracks to whet our appetites, I noticed a few folks saying that he’d lost some steam. I’m a loyal but objective fan, and something tells me that all may not be what it seems. Let’s look at the chart. First thing I notice is that Drake’s natal Mars in Aquarius (a placement Jay-Z also shares) is being sextiled exactly by transit Mars which has stationed at 8° Sagittarius. Mars is the planet of energy, action, drive, and aggression. Sextiles are considered to be harmonious, but there must be a conscious effort. They require you to take action. Sextiles can bring you opportunities or ideas, but you have to do the work if you want to realize your goals. Drake’s efforts are going to be called into question over the course of this Mars Retrograde (Rx). Mars wants him to review the way he’s been going about things in his personal life and how he’s communicating with the women in his life, especially his mother. 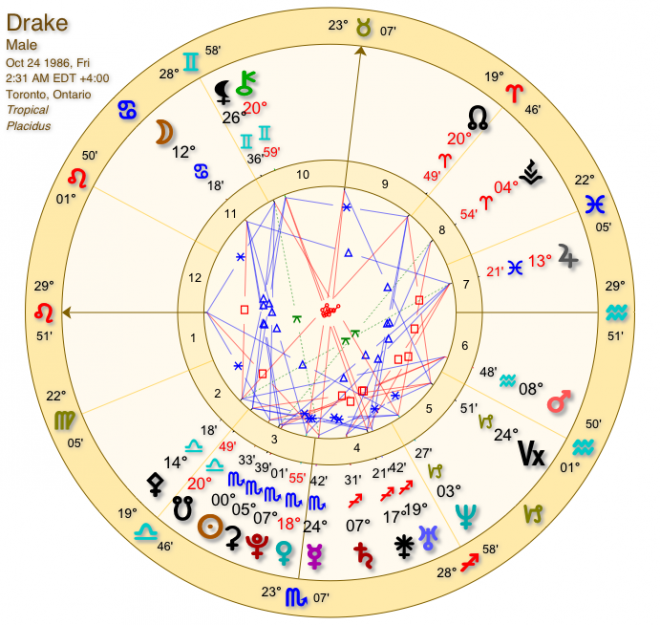 Drake’s Moon is in Cancer in his 11th House of the money you make from your career. The Moon rules the public and women as a collective. Quite literally, Drake makes his money based on how women-at-large feel about him. If he wants things to improve in his life, he needs to tap back into the Divine Feminine, but he has to do it with respect. I think Drake will be challenged on what he really feels and believes about women. This could be a make or break moment for his career over the summer. Transit Mars is also going to backtrack over his natal Saturn at 7° Sagittarius in early May. When Mars & Saturn meet, it can feel like your work flow slows down to a maddening crawl. This transit sometimes manifests as the signal of the beginning of a project that can do very well if you stay calm, focused, and take care of yourself. Looking at his chart, I wonder if Drake is releasing throwaway tracks to make people think he’s fallen off. I wouldn’t put it past him. His Aquarius Mars never does things the way you think they should. Aquarius Mars folks tend to make moves that look erratic and non-sensical to others, but when everything falls into place for them, they don’t seem so crazy—they seem like a genius. One could be worried that he could falter under the upcoming Mars Rx going from Sagittarius into Scorpio, but like all of astrology, that depends on him. His Taurus MC (destined for a career using his voice) answers to his retrograde Venus (the planet of love, attraction, relationships, prosperity) in Scorpio—he’s no stranger to retrograde Scorpio energy. He really is the Bane of this Scorpio energy game, so he has no problem waiting in the shadows watching his scheme unfold or using his relationships for profit. He strategizes like no other thanks to his Scorpio stellium in 3rd House of communication & thought process, as evidenced by him putting Meek Mill on the OVO Fest screen. Like I said, he has to heal his relationships with the women in his life, and he may also need to mend things with Nicki Minaj once and for all. Transit Uranus is exactly on his North Node (the path for your soul to follow in this life) in 20° Aries, which is happening in his 9th House of public relations, marketing, and professional speaking—it’s the engine that drives his career. The 9th House also deals with your philosophy, beliefs, vision for the future. Hello, VIEWS from the 6. The transit Sun in Aries is approaching the same degree of his North Node, so if he was thinking about releasing Views from the 6 on Friday, April 8, that would be the smartest thing he could do. This album could be his best yet, IF he’s done the work. We will soon see if Saturn—the planet of reputation, hard work, and effort—is pleased. On top of all of that, if he releases it on April 8, he’s under the light of the Aries New Moon. New Moons are perfect for launching new projects, setting intentions, and giving yourself a fresh start. This Aries New Moon is pushing Drake to change what he believes about himself so that he can give his career a new beginning. Who does Drake think he is? This album could be a key to us (him and the rest of the world) finding out. Once he puts this album out, it’d behoove him to take some time to do something outside of the norm and spend as much time as possible with those he considers to be his family until Memorial Day. By then, Mercury won’t be in it’s shadow and it will be in the same sign as his Taurus MC, giving him a sense of clarity and resoluteness about his career and the direction it’s heading in, leaving him free to feel secure with all of the women in his life.